Sportsmen need a variety of workouts besides strength building. It is not about doing the same workout again and again but diverse exercises in your gym routine can actually help in building stamina and endurance. Body conditioning exercises are essential for injury prevention during rigorous training. These workouts should be combined with power building workouts which can be done in an efficient manner to build stamina and strength. It is important to stay focus on all targeted key muscles as you try to balance your body and get the best out of your fitness routine. This is the best power building exercise which helps in body conditioning which means lesser chances of injuries. 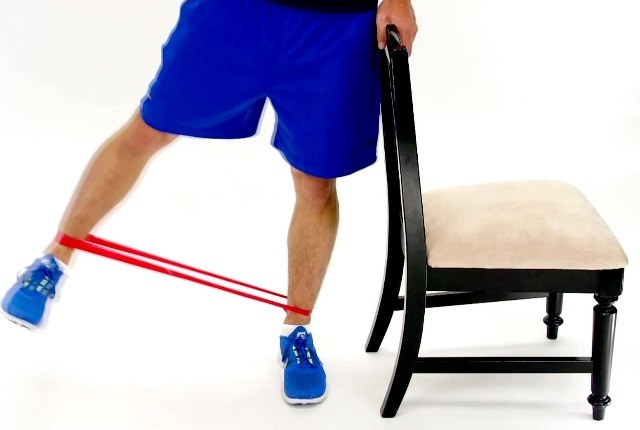 You need a resistance band which shall be attached to a stable object. You need to loop the other end just around the right foot. The band has to cross just in front. Your left leg shall be a bit behind and your right leg straight. You can lift your leg to the right. Count two. Release and get to the original position. Repeat using your other leg. You need to prop on your elbows. Your feet shall be a bit apart. Your body has to be aligned. Your abdominal muscles will be tight. Your shoulders will be just above the elbows and then down and back. You shouldn’t be hunched up in this position. Stay in this position for at least 45 seconds or one minute. As you are able to increase your endurance level, you can add more time. Planks are the best body conditioning and power building workouts for sportsmen. It works on lower back, shoulders and core muscles. You need to start this workout by lying down on your side. Slowly raise one leg up. You will make a 45 degrees angle with your leg. Your leg should not move in front of the body. It should not also go behind the back. You need to raise your leg at least 15 times. You can then repeat using your other leg. This exercise helps in improving blood flow in the abdomen, thigh and leg muscles. It helps in knee conditioning and building power to your legs. Sportsmen need great power in their muscles. Flexibility and body conditioning keeps them going and helps in working out for long hours. Start this workout with a medicine ball of five pounds. Keep it on the floor just next to you. You will sit down as you keep your legs extended.Now, you can roll your shoulders back. Sit tall as much as you can. Your back shall be straight. You can lean back till your abs are correctly engaged. If you wish to make the workout a bit difficult, you can lift your feet a bit from the floor. Twist to your right. You can pick the medicine ball. As you hold the weight, you can twist from your right to the left. You can move as much as you can as you maintain your form. Russian twists are best exercises for bodybuilders. Heel raise is the best workout to tone your thigh muscles. It helps in preventing injuries due to rigorous training. Stand on the ground, as you keep your feet on floor. You need to lift your heels up as you keep the balls of your feet on ground. You can lower your heels and then again repeat the workout. This is a great workout which tones your lower body and conditions your leg muscles.